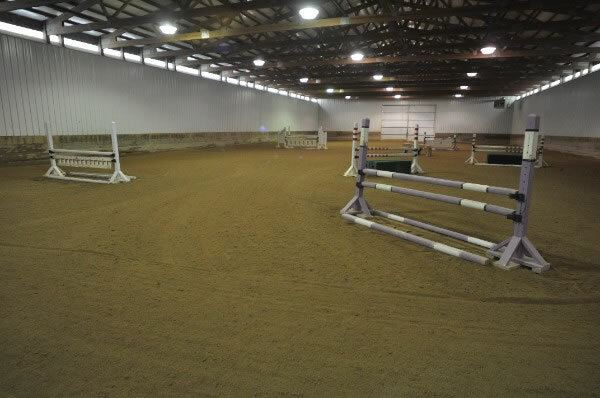 Grande Prairie Equestrian Center is an outstanding horse stable located in Oswego Illinois. Grande Prairie Equestrian Center is run by Judgment Farms Inc. and caters to hunter and jumper riders of all levels. We provide exceptional amenities and training for riders of all levels; from those just learning, to seasoned "A" circuit competitors. Grande Prairie Equestrian Center is situated on a beautiful 30 acres on the corner of Roth Rd. and Wooly Rd in the town of Oswego Illinois. Amenities include heated tack rooms & viewing galleries, automatic horse watering bowls, rubber matted stalls, and a heated indoor arena. Outdoors you will find a newly constructed viewing pavilion located next to our Grand Prix size arena. Our stable offers riding lessons, boarding, horse sales, and training; all in a comfortable and welcoming environment.